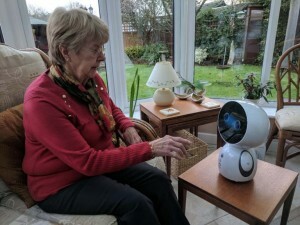 Bristol start-up Service Robotics has exceeded the crowdfunding target for its first product, a robot companion service that has been developed for the elderly to help them to live independently. GenieConnect also aims to alleviate loneliness – something which Age UK estimates affects more than 1.4m people in the UK, while according to the Office of National Statistics some 3.8m people over 65 in the UK live on their own. Interest was so high in the start-up, which is based at tech and innovation hub Future Space, that it raised more than 178% of its £120,000 crowdfunding target since the initial launch of the campaign last December. More than 260 investors have pledged to take an 11.5% equity in the venture, raising more than £214,000. 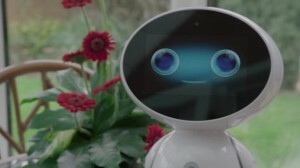 GenieConnect works by pairing an AI-driven robot companion, pictured right and below, with a friendly service agent, providing live video support on the robot screen, via a simple voice command. A pilot project will put around 150 ‘Genies’ into homes in Bristol and around the UK over the next few months ahead of a potential commercial launch in the second half of this year. Service Robotics chief executive Rob Parkes said: “Our elderly population is growing, with so many people over the age of 65 living alone. Our mission is to enable independent living for longer and to help alleviate the huge negative impact of loneliness. “We have been overwhelmed by the response we’ve had our GenieConnect project and the support only further highlights that there is a gap in the market here. Crowdfunding is one of the new forms of funding being explored by the science and tech businesses based at Future Space looking to scale up and grow. The hub on UWE’s Frenchay Campus provides business support for all its resident companies to enable businesses like Service Robotics reach their goals and growth targets. Future Space centre director Marty Reid said: “Service Robotics is doing some incredible work which will revolutionise many aspects of the elderly care crisis. “This form of funding is relatively new for many science and tech SMEs and continues to evolve. The experience of Service Robotics will help us offer even better support to Future Space companies who are looking to raise investment. Future Space is run by Oxford Innovations and co-located with the Bristol Robotics Laboratory and Health Technology Hub in the University Enterprise Zone. It connects entrepreneurs and tech innovators with scientists, researchers and graduate talent – to spark collaboration, innovation and growth.